It's quick and easy to set-up a coaching profile and once it's done you'll be able to apply for jobs, receive feedback from employers and add your session to our activity finder. You'll also be the first to hear about our latest courses and funding opportunities and if you upload your qualification details we'll even send you helpful reminders when your minimum standards need renewing. 1) Click sign-up in the top right hand corner of this page. 2) Fill in your details. 3) Click on the link in the confirmation email to confirm your registration. 4) Click 'Dashboard' in the top right of the screen and then 'My Profile' and complete the rest of your details. You will see you can also add clubs/organisations that you are a part of. 5) Don't forget to click to receive coaching newsletter. 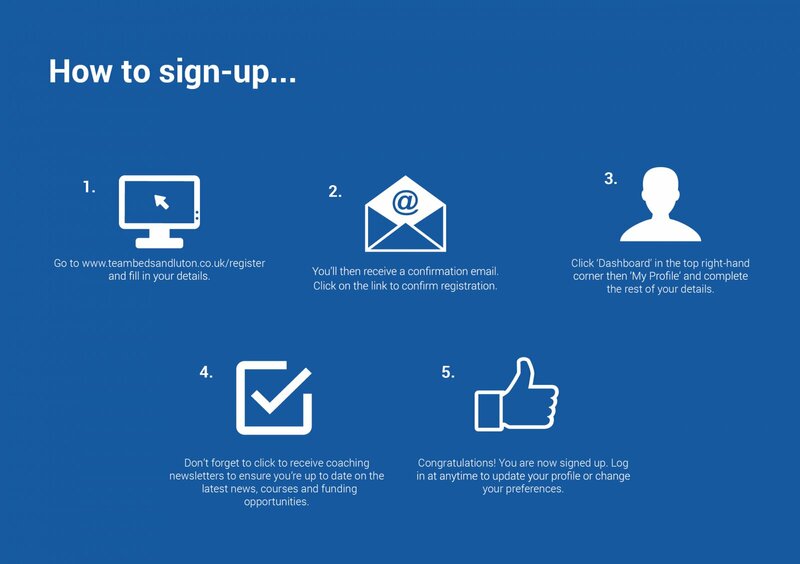 6) Congratulations you are now signed up. You can log in at any time to update or change your information.